In a crossover crazy world Cadillac certainly hasn’t given shoppers many reasons to visit one of their showrooms. But perhaps it was worth the wait. This is the first ever XT4. From subcompact to gargantuan, automakers’ SUV lineups are growing in every direction. But until now, Cadillac’s offerings have started at the midsize XT5 and jumped from there right to the big boy Escalade. So in comes the XT4, compact-sized and priced from $35,790; about $7 grand less than its bigger brother. By my count this Caddy has 8 direct competitors and each and every one of them follows a similar formula; a starting price in the mid-$30s, a standard 2.0-liter 4-cylinder turbocharged engine and the choice of either front- or all-wheel drive. The XT4 also debuts Cadillac’s new trim strategy. The base model is known as the Luxury trim. From there, there’s the Premium Luxury and Sport models – each with identical pricing but distinctive appearances. While this Sport features gloss black exterior accents, alloy pedals, and a sport steering wheel, the Premium Luxury goes with bright metallic accents. More importantly, this Sport offers the Active Sport Suspension as an option. It’s only available with the upsized 20” wheels thus adding $2,300 to the price. This setup continuously makes adjustments to the XT4’s ride and handling attributes based upon road conditions and driver input to widen the dynamic range from soft and isolated to greater body control. It delivers as promised, with a sophisticatedly supple ride quality that can also adjust to your sport mode aspirations. The XT4 has no qualms about taking on your favorite driving road. Utilizing Buick’s twin-clutch all-wheel drive system, sourced from driveline supplier GKN, it offers better performance during acceleration and cornering by splitting torque between the rear wheels. That is when it’s toggled on. This setup requires the driver to engage all-wheel drive mode which automatically comes on in Sport mode. If the vehicle is in AWD mode when the engine is turned off the XT4 will come on in AWD mode at the next startup. The custom-developed Continental tires also contribute to the excellent overall balance. Sport Mode improves handling and acceleration, modifying steering effort, transmission shifting, AWD torque, and suspension tuning. The 237 horsepower engine is a spritely little thing, producing 258 pound-feet of torque, moving the XT4 confidently along throughout its 9 speeds. Though the cabin’s quiet tuning produces a peaceful environment, this motor sounds gruff – more like it belongs in a Chevy. It surprised me at first. Power delivery is a little punchy but nothing too juvenile for a turbo and gas mileage of 24 mpg in combined driving is better than that of the Lincoln MKC but despite having an extra gear, not as efficient as the Volvo XC40. Though it would be nice to have the even zippier 2.0-liter engine from Buick the XT4 with its cool AWD system and adaptive suspension imbue it with a nicely balanced ride quality and notable handling attributes. The steering is satisfying and the new braking system provides excellent feel. It’s a premium, fun little drive. I love the bold look, the smart interior packaging gives it XT5-like rear seat head- and legroom with enough cargo room to be useful, the cabin is pleasing to the eye and to the touch, the electronics are typical GM excellence with OnStar, Wi-Fi and full smartphone integration and my loaded tester brings massaging front seats with heating and ventilation, wireless device charging, a great heads-up display, a hands-free liftgate, a dual panel sunroof, heated rear seats, heated steering wheel and a trailering package that permits up to 3,500 pounds towing. One note about the massage feature – it’s air bladders make some noise. This is a fast growing segment with lots of new choices – most of which are quite impressive. And the XT4 can be added to that list. The just right sizing, the energetic turbo, the deft handling, the luxurious cabin – it all adds up to the kind of vehicle customers can’t get enough of right now. 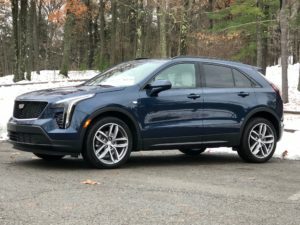 My biggest takeaways this week with the XT4 are how quiet and comfortable it is, the dialed in nature of the chassis, the energetic punch from the turbo and how sharp it looks – this is the most attractive new Caddy on the road. But there are also some turnoffs for me. For example this engine just doesn’t sound like it belongs in a $50k+ Cadillac, there’s no embedded navigation or street sign recognition and that price…a fully loaded Sport will give you some sticker shock. The Enhanced Visibility and Driver Assist packages as well as navigation can be added but further increase this XT4’s sizeable $52,265 as-tested price. Still, the XT4 is an excellent addition to the brand’s SUV lineup. I’d go as far as to say it’s my favorite non-V Cadillac model. And it will undoubtedly sell very well.